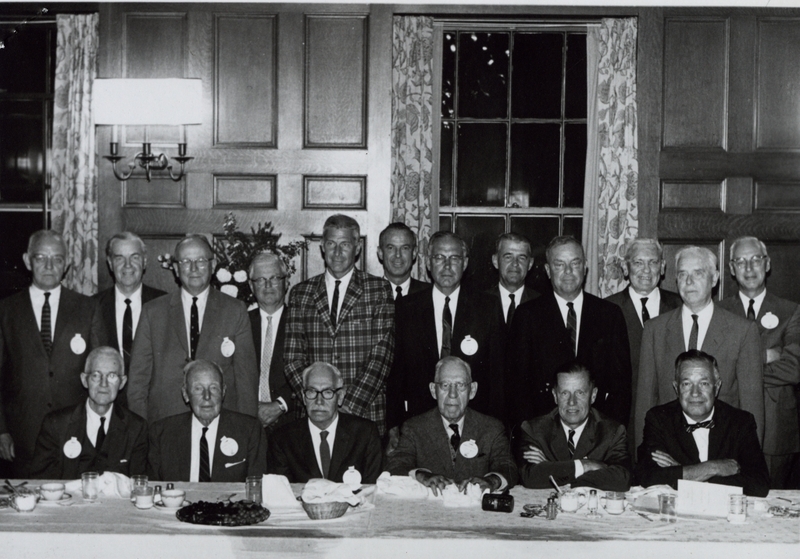 Group portrait of past Presidents of the Bowdoin Alumni Council, taken in Maine Lounge of Moulton Union at the Council's 50th Anniversary Banquet. In order of terms of office: first row, left to right: Leon V. Walker (Bowdoin 1903), Thomas R. Winchell (1907), Dr. Rufus S. Stetson (1908), William R. Crowley (1908), Alden H. Sawyer (1927), Richard S. Chapman (1928). Second row: Ezra Pike Rounds (1920), Sanford B. Cousins (1920), William D. Hyde (1938), Charles L. Hildreth (1925), Gilbert M. Elliott, Jr. (1925), Daniel F. Mahoney (1919). Third row, left to right: Francis B. Hill (1923), Leland W. Hovey (1926), Vincent B. Welch (1938), Frederick P. Perkins (1925), Dr. Ralph T. Ogden (1921), Arthur K. Orne (1930).